Coconut oil is probably one of the most versatile raw beauty ingredient used today. Aside from its moisturizing properties, it can be used as a base for many other beauty and hair recipes that will change your beauty regimen, I know it’s almost ridiculous when you consider the versatility that coconut oil has especially of the fact that it’s also conveniently found in the supermarket. Isn’t it such a waste to not even give these awesome coconut oil uses a try? So here are some coconut oil uses you can start with. A few daily spritzes can repair dry or frizzy hair, as well as a flaky scalp, pour it out from a container and apply it by hand or use a spritzer to apply directly to your hair. I recommend doing this at night or very lightly in the day. Loaded with saturated fats, coconut oil helps retain moisture in the pores leaving your skin supple and plump. This is also a good reason to use coconut oil as a massage lotion for that instant spa treatment your skin so badly deserves. Mix with cranberry powder and beetroot powder; add more beetroot powder for a darker shade. This is probably one of my favorite coconut oil uses, it’s super easy and it’s healthy on the skin too! Add aloe vera and essential oils to coconut oil to make shaving cream, then apply before shaving to avoid cuts and flaky skin. The coconut oil will act to help make the skin smoother and calmer to prevent the appearance of stubbles. Combine with sugar scrub for a softer, more supple skin. You can also use coffee grounds or salt in place of sugar for a natural and healthy body scrub. Switch to this chemical-free alternative. Better for the environment and for your underarms! This goes really well for women who shave their underarms as well because coconut oil calms the skin leaving it smoother and healthier. Add Around 20-40 drops of citrus essential oils to your coconut oil body wash for a wonderfully citrusy smell. Get rid of the sniffles with a coconut oil vapor rub. Apply coconut oil on a warm, damp cloth and let the oil do its magic. You can also add a drop of eucalyptus or peppermint oil to about 5ml of coconut oil for added minty vapor. Treat your pearly whites to an organic, chemical-free alternative toothpaste made with coconut oil. Coconut oil is known to whiten teeth and is also used in oil pulling practices. Suffering from chapped lips? Try using coconut oil lip balm before going to bed, this would be the perfect homemade gift to your girlfriends. These are just some of the many coconut oil uses available for everyone to use. 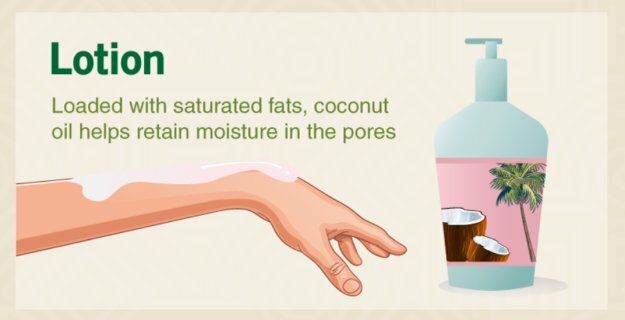 Personally, I haven’t even gone beyond using it as a lotion, so there are definitely other recipes to try with coconut oil uses that I need to get on as well.